The Republicans' changes to our tax system may at first glance appear to benefit most Americans. During 2019, 125 million Americans will see at least some reduction in their taxes and only 15 million will see their taxes increased. But, the plan changes over time. By 2027, all of the provisions reducing individual tax rates will be cancelled, and provisions relating to how the brackets are adjusted for inflation would remain in effect, steadily increasing individual tax rates. The tax cuts for corporations, on the other hand, will remain in effect permanently. By 2027, 50 million people's taxes will have increased. The full picture, however, is even more complicated. For starters, many people's tax cuts will be very small. Someone earning $20,000 per year will only see a tax cut of $8 a month. 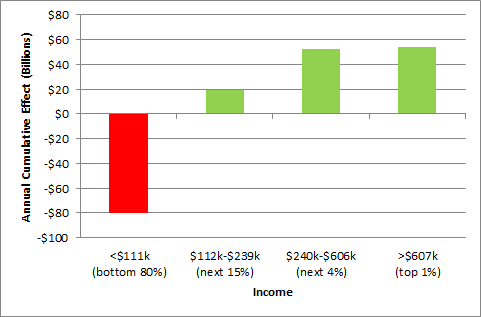 A family with an income of $60,000 will see a tax cut of $70 a month. Also, the effects are lopsided geographically. By 2027, 19 states would be paying more in taxes than they do today: Missouri, Indiana, West Virginia, Wisconsin, Oklahoma, Georgia, Montana, Alabama, South Carolina, Nebraska, North Dakota, Mississippi, Louisiana, Florida, Wyoming, Idaho, Maine, North Carolina and Alaska. To further complicate matters, the plan also elminates the individual healthcare mandate, which will result in an estimated 13 million fewer people having health insurance and a 10% increase in the cost of non-group health insurance policies. When factoring in those costs, the poorer 3/5ths of Americans will be worse off by 2027. But, that isn't the worst of it. The core issue is the fundamental mismatch between how the tax cuts are being paid for and who is receiving them. The national debt may seem less tangible than tax rates. 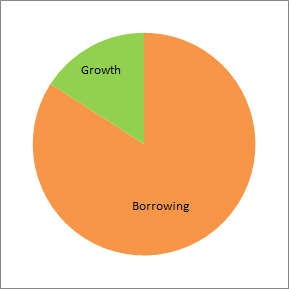 $100 borrowed has a less immediate impact on a person's situation than $100 in tax reduction. But the national debt is very real. Every year, we need to pay to service the debt and every additional Dollar of debt we accumulate leaves less room for future spending or tax cuts. Unlike the tax cuts, which are distributed unevenly across the population, the burden of the debt is best thought of as being shared evenly by all Americans. Each American is affected by the constraints on spending and each American is ultimately equally liable for that debt. If anything, lower-income Americans might be more directly impacted as higher debt creates more pressure to cut the safety net and because lower-income Americans are less able to evade the debt by moving themselves or their assets offshore. 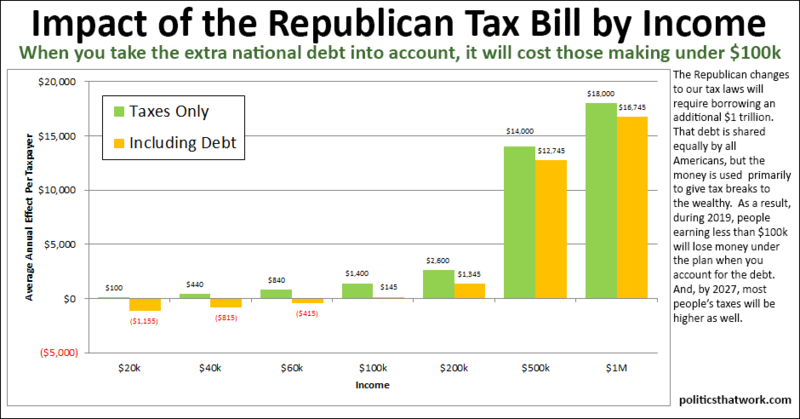 The Republican tax plan calls for borrowing an additional $1,255 per year per taxpayer. While the bottom 80% of Americans will pay for 80% of the cost of the tax cuts, they will receive only 30% of the benefit of those tax cuts. 70% of the benefit will go to the top 20% of Americans by income. 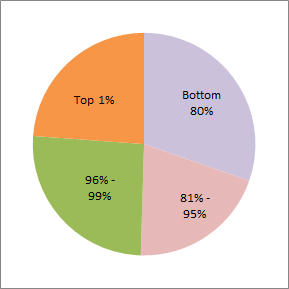 In fact, almost 50% of the tax cuts will go to just the top 5% of earners and almost 1/4 will go just to the top 1%. It is not clear that there is any legitimate policy rationale for engaging in this type of transfer of wealth up to the wealthiest. The basic economic theory of the diminishing marginal utility of wealth (the idea that the richer somebody is, the less benefit they get from an additional Dollar) tells us that concentrating wealth is harmful. Given that the bottom 80% of us have not seen significant income growth in 40 years, while the top has seen massive income growth, this would seem to be a particularly bad time to be shifting tens of billions of Dollars from the bottom 90% to the top five perccent. So, while you may receive a small reduction in the taxes taken out of your paycheck this year, remember that you are paying for that tax cut by taking out loans, and, for most Americans, the loans are much larger than the reduction in their taxes. You can read more about economic inequality at the national level on this site's post on inequality in America or by picking up any or all of the following books: Thomas Piketty's Capital, Joseph Stiglitz's The Price of Inequality and David Cay Johnston's Divided: The Perils of Our Growing Inequality.